General clauses or standards (Generalklauseln, clauses generales) are legal rules which are not precisely formulated, terms and concepts which in fact do not even have a clear core. They are often applied in varying degrees in various legal systems to a rather wide range of contract cases when certain issues arise issues such as abuse of rights, unfairness, good faith, fairness of duty or loyalty or honesty, duty of care, and other such contract terms not lending themselves readily to clear or permanent definition. 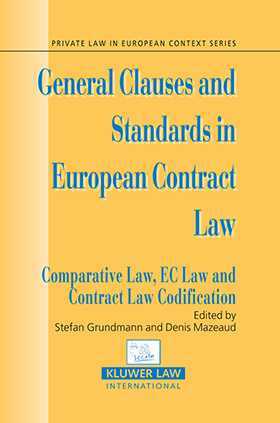 Here for the first time is a systematic discussion of this kind of rule in the evolving and dynamic context of European contract law. A collection of twelve insightful essays by leading European law authorities, the book is based on a conference organized jointly by the Society of European Contract Law (SECOLA) and l'association Henri Capitant, held in the `grande salle' of the French Supreme Court in Paris in 2005.
the European codification dimension, in which a potential instrument on the European level would compete with national laws and develop closely with them.